Back in November, the Landmarks Preservation Commission told architect Peter Guthrie to “calm down” his design for a block-long, glass-faced residential project in Tribeca. So he returned to the commission last month to show them something wholly different. 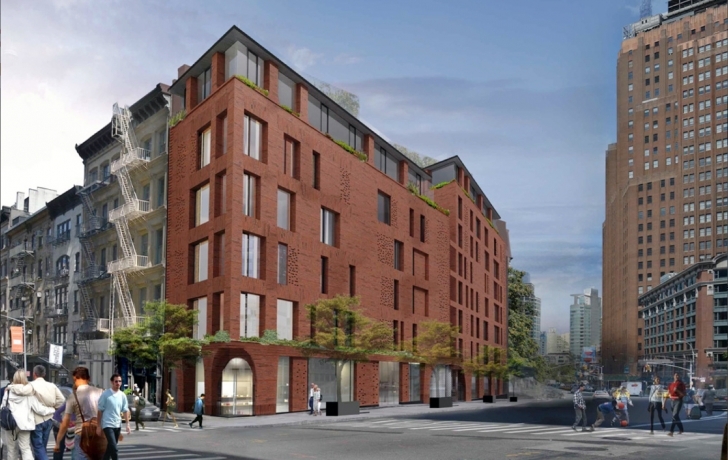 Abandoning glass for red brick and trading his idiosyncratic penthouse scheme for a simple one, the architect’s new concept won ef­fusive praise and official approval from the commissioners. Not so from the neighbors who live near the site. They’ve opposed it from the start and vow to fight on. Those penthouses are now flat-roofed, with simple brick columns. The building’s main brick facade is most notable for its irregularly spaced windows (an apparent reference to lot-line windows in the neighborhood) and arches modeled after others in the area. The elevator no longer goes to the roof, which means there will be a lower elevator bulkhead than the one that had drawn many complaints. The commissioners lauded the scheme with a rare display of exuberance. “Extraordinary and exhilarating,” responded Frederick Bland. “I’m captivated,” said Elizabeth Ryan. But there were no kind words from Eileen Bermingham, who lives next door at 17 White Street and who has led the opposition to the project since it was introduced last October. The building needs a variance because it occupies more of the lot than the city allows, and she said her group still has a chance to stop it. “We’re unhappy with the decision and we will not back down on fighting it at every level,” she said, following the commission’s approval. Among her continuing concerns, Bermingham said, is the impact of construction on the exposed east wall of her building. The developers have insisted that a structural engineering firm will be expertly overseeing the work, but Berm­ingham remains unconvinced. “There are a lot of levels [of problems] that are disturbing,” she said. For Lynn Ellsworth, founder and president of the local preservation group Tribeca Trust, the choice of brick over glass was a “forward movement.” But she said the design is still out of character with the surrounding buildings—the irregular window placements being a prime example. Submitted by admin on Wed, 01/22/2014 - 3:04pm. We feel strongly that even with the changes that were compelled by the community’s opposition, the proposed development continues to be inappropriate in the context of the existing fabric and fiber of Tribeca. Both in terms of height, massing and design, the proposal requires further modifications before it can be accepted by the community. The developer has acknowledged that even with the Landmarks approval the proposed buildings cannot be built as-of-right without zoning variances from the Board of Standards and Appeals. They have not been forthcoming as to the variances that are required. Once an application is filed with the BSA, then the community most definitely will continue in our efforts to seek to compel further changes so that the development of this property will be harmonious with our adjoining building at 13-17 White Street and appropriate to Tribeca.